Our custom designed event and wedding invitation maps are a perfect solution for guiding your guests to your event locations, and at affordable prices, to boot. Purchase a printable PDF to print and create your own invitation enclosure cards, or choose a high resolution JPEG image to upload to your favorite print shop. 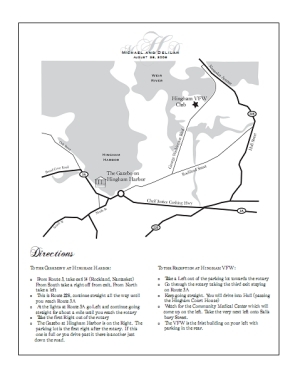 Our maps are completely customized to cater to your invitation needs and sense of style. We create maps from the elegant and classic, to whimsical or casual. What you will come away with is a completely customized, one-of-a-kind piece to accompany your event or wedding stationery. Choose your colors - black and white or coordinate with your wedding colors! Match your invitations! 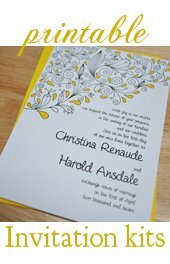 Send in a picture or scan of your invites for custom coordination. What's your wedding style? Let us in on the details and we will customize your map to your unique wedding style! Unlimited proofs! We want you to love your map. Our designers will keep working on your map until it is perfect. To order your custom maps please fill in the forms below. There are several different options to choose from, starting with a simple 1 or 2 location map all the way up to Out Of Town Visitor maps chock full of locations for your guests to check out. Whatever your needs may be, We can create any kind of wedding map that you can dream up. We strive to create a map to match your invitations and event style. We offer full color designs no additional cost. Whatever your vision for your map may be let us in on all the details and we will create something one of a kind just for you! What you are ordering is a printable PDF or JPEG file which I will design for you to print onto your own paper in the privacy of your home. We do not print the maps in house for shipping. Map fees are payable through Paypal and are due upon submission of the your order. We do not begin designing a map until all funds are paid in full. Proofing of original designs are free and unlimited. If you are unhappy with the map we will continue to work on it until you are satisfied. 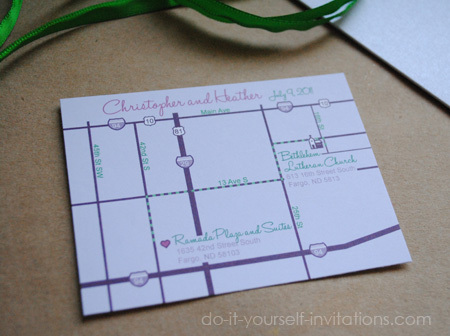 Invitation maps are offered in up to 8 1/2" by 11" in size. They can be designed to print multiple per page with cutting guidelines for easy print and go maps. View samples and customer feedback at the custom invitation map gallery. Visit the Invitation/Wedding Map FAQ Page or contact us for any questions you may have. To place your order fill in the order forms below. If other payment arrangements must be made please contact me immediately. Payments are to be made up front and are non-refundable once the design process has begun. Proofing is free and unlimited as long as you are not changing locations or adding information to the map that was not included with your order form. Changes of this nature will incur a proofing or redesign fee. Upon order conformation expect to see a proof copy of your map within 7-10 business days. Rush orders can be placed for an additional $35.00 which will place your invitation map at the top of the que. If you need a rush order please contact us for availability and time estimates. Once a we are given the OK that your invitation map is complete we are no longer responsible for any typos or misprints. Any proof copy that we send out that is not sent back for changes or sent back with an "OK to print" from the client within 1 month is considered done and the file is closed. Accounts with over 1 month of inactivity will be billed an extra proofing fee. If you have any other questions or requests please feel free to contact us any time. Need a consultation before you order? No Problem! Simply fill in the form below and make a note that you would like a consultation and price quote within the "notes to designer" form field. We will get back to you as soon as possible!